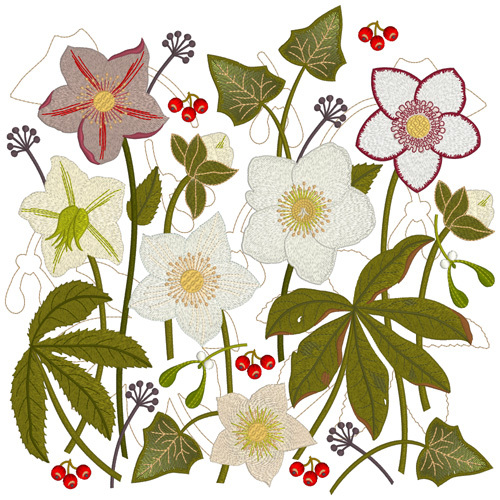 So in the final set I have introduced one new hellebore along with several different dimensional rosettes and a new centre. Incorporating frilly rosettes to the flower makes the embroidery too dense, but it does work well carefully placed and held in place by the new centre. Also as a final flourish I have added more than 12 designs to this set for 12″ x 8″ hoops. 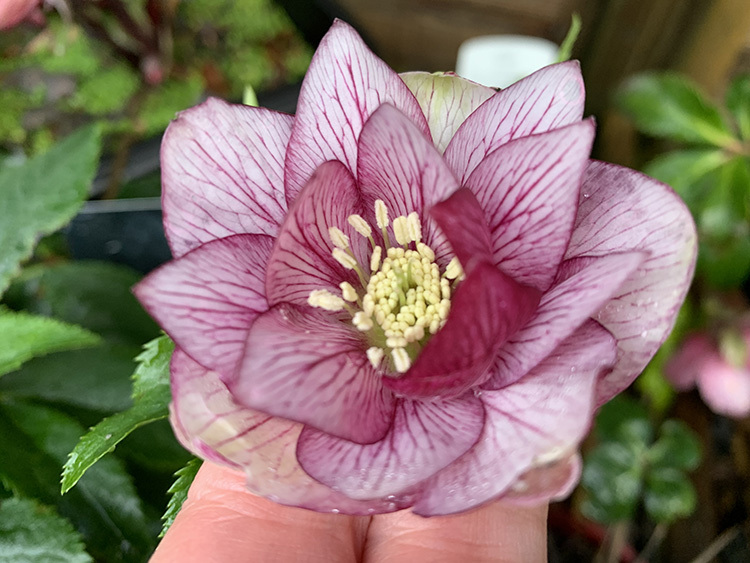 I just could not resist as more and more hellebores have been coming into flower these last weeks giving me more and more ideas. Later this year I hope to develop a collection based on fuchsias, which I am even more passionate about. Working on this collection will, no doubt, have benefited this future collection. 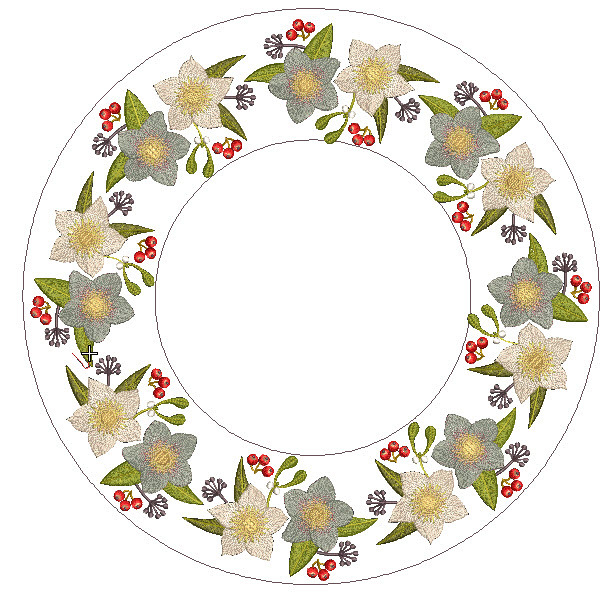 This is a special design, in the final set, that works well on its own, but it is a quarter of this wreath and as it comes with Outline alignments stitches, positioning it accurately will be easy. As well as the usual Outline alignment stitches there are a few at the end of the design to show where the next design will fit. I have made this large stitches that can be removed easily. 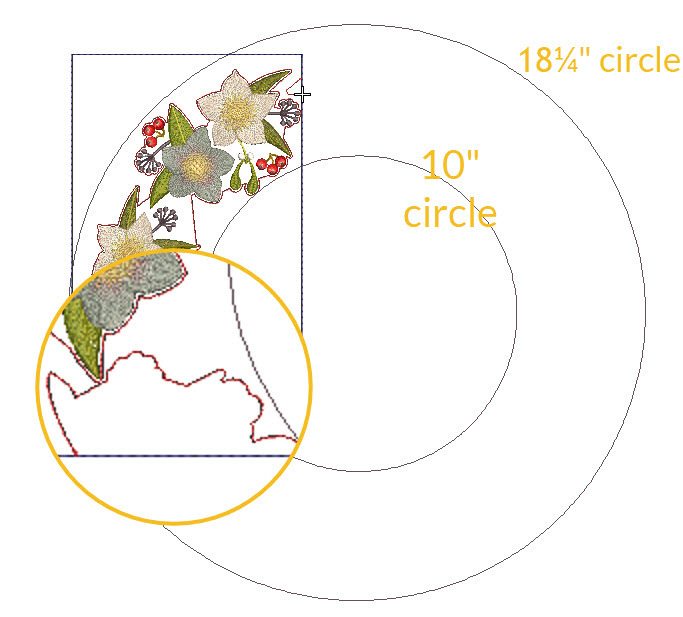 The wreath fits between two circles, the outer one having a diameter of 18¼” and the inner one having a diameter of be 10″, so draw these out on your fabric to start so you can see the position of the finished wreath. Note the position of the leaf that fits into the wreath. Each Christmas I prepare a special embroidered card for my sister. Back in December I decided to go one step further and I made a framed embroidery with my hellebores. I prepared some of the rosettes that go in the centres of each flower. Remove your hoop from the machine to accurately position these. Test by pushing a pin through the middle and check the back to see if it really is in the middle. They were stitched out on tulle so they were very light and the tulle is hardly visible. I cut carefully between each node to that they were not too uniform. Stopping my embroidery before the rosette is stitched out I used a glue stick to hold these little rosettes in place. I have discovered that sticky tape is needed to hold them in place while the centre section is embroidered as the needle may move them and catch them in the stitching before you can stop it. Here is the finished design, GFE-WJW-5-8. Take a peek at GFE-WJW-5-15 which includes several rosette centres that can be used for most of the flowers in this collection. Remember not to stitch out the element of the embroidery that they are replacing. 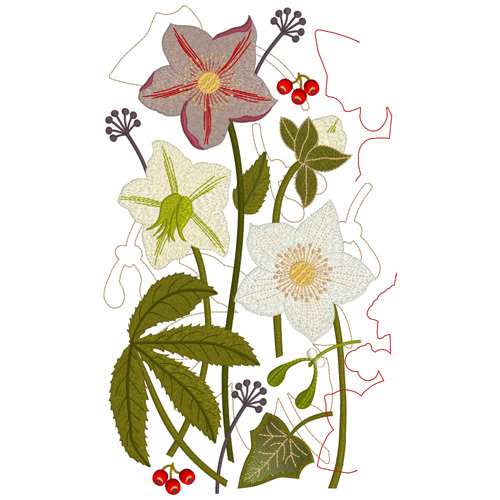 I was unhappy with the finished embroidery as the hellebore on the left with the seed head was sitting poorly and had a hollow appearance. I decided to experiment with the dimensional seed head and found it best to cut away one of the four pairs of seeds. Then it was possible to place it flat on the flower. A dab of glue and a few stitches held each section in place. I then attached the seed head in place with a few stitches and started to prepare the embroidery for pressing. This is the back of the embroidery and it is always important to remove as much stabiliser possible and to trim all the jump stitches to prevent puckering. Best not to press the areas where you have added elements. It is very important to prepare the backing of any embroidery and in my experience a little batting always softens the look. I had purchased a box frame for this project and this required a little substance so as well as the batting I used stitch and shape. The silk dupion was wrapped around this layer of batting and stiffening, and attached with double sided sticky tape. However when I placed the embroidery in the box frame there were a few gaps in some of the corners and even with some adjustment I could not get the mounted embroidery to sit perfectly. A little rummage in my lace collection found the perfect narrow lace to go all around the edges. I attached it with small hand stitches, and everything look so much better. As the frame was very plain the lace really complimented the embroidery, and I do love to use lace for my embroidery projects when I can. Here you can see a close up of one of the offending corners that had gaps. You will be pleased to know that my carefully wrapped parcel arrived safely in Somerset and my sister was delighted with her Christmas present. 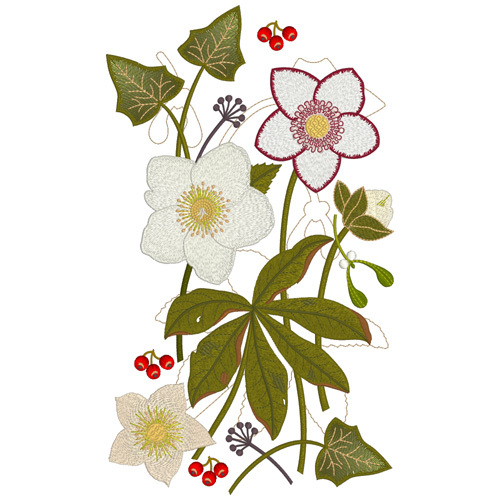 I have a 12″ x 12″ box frame that I will use to stitch out GFE-WJW-5-12 and GFE-WJW-5-13 which have been created for a large square embroidery. I will share how that works out in a future blog. They do however work well on their own. Again I have added Outline alignment stitches at the end of the first design showing you were to place the second part. I hope you enjoy using these designs and I look forward to seeing photos of what you create with them. There are so many uses for them. I hope to make a dimensional project with the flowers and leaves. Perhaps a table centre piece or add them to a wreath. This final set is now available at a special introductory price for two weeks. 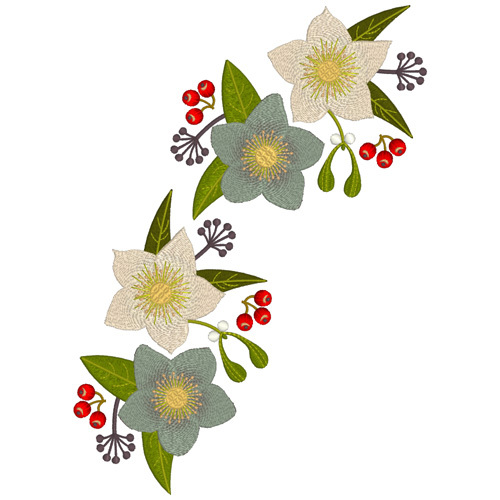 There is no better time to plan your embroidery for next Christmas. To view all the designs in this collection click on the Winter Jewels collection link on the right. P.S.Parts of this blog were posted in December but they seem to have gone missing so please excuse the repeats. 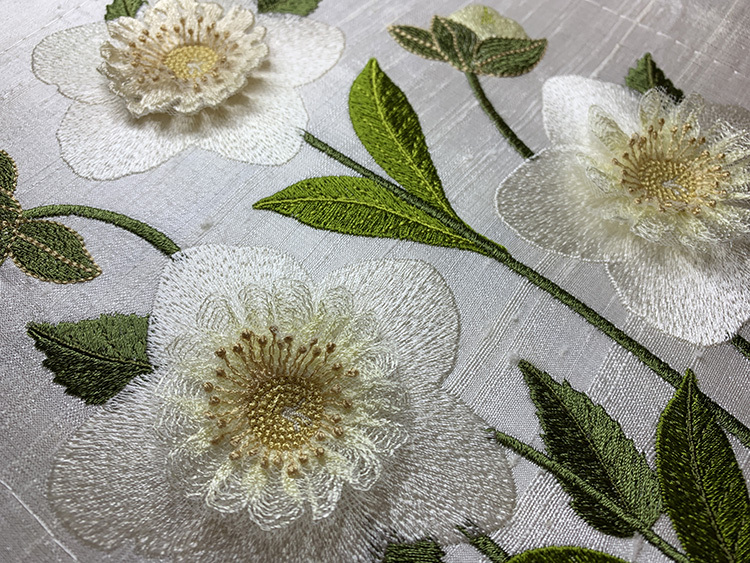 This entry was posted in Discussing machine embroidery, Embroidery projects and tagged 3 Dimensional embroidery, Christmas, Digitising flowers accurately, life like flowers, Outline alignment stitches. Bookmark the permalink. Hazel, you have completely outdone yourself with this set, so magnificent. They truly loo like real flowers that you can touch and smell! 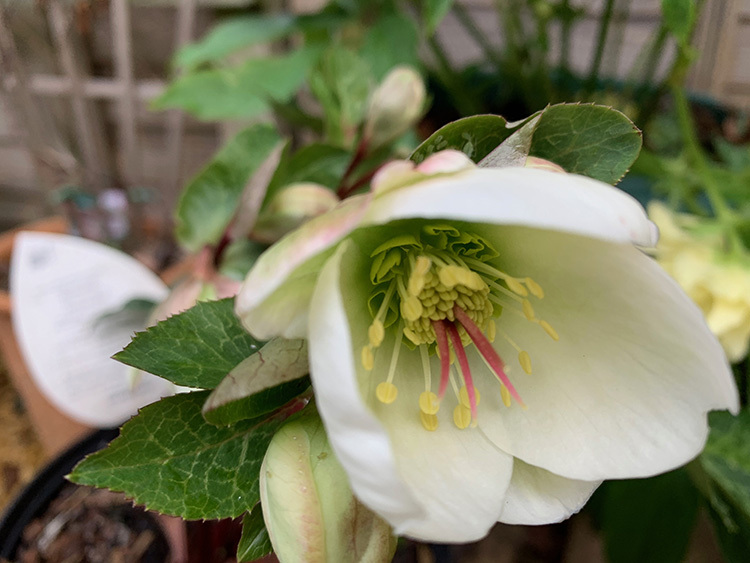 Stunning work Hazel, I love hellebores and the organza centres truly give them life. I did my centre on tulle which gives an incredible lightness to the embroidery.